Looking for a better way to manage and grow your small business? Customer relationship management (CRM) software can make all the difference. Whether you're looking for a robust CRM software solution, a simple one designed for very small businesses to fit your budget, there's a CRM software choice for you. 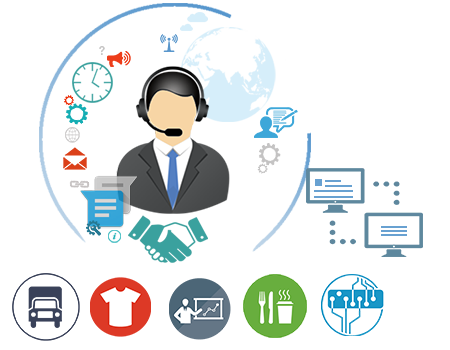 Rising Wings brings you the best CRM software in Surat for all those who wants lot more in their CRM software. By using this strategy, all dealings involving servicing, marketing, and selling your products to your customers can be carried out in organized organized and systematic way. By using a CRM strategy for your business you will be able to increase the revenue of your company to a great extent. Using the data collected, you will be able to popularize marketing campaigns in a more effective way. The strategy also facilitates cross selling whic his the practice of offering complementary products to customers, on the basic of their previous purchases. This is done by interacting with the customers and getting an idea about their wants, needs, and patterns of purchase. The details thus obtained will be stored in a central database, which is accessible to all company executives. The sharing of customer data between different departments will enable you to work as a team. This is better than functioning as an isolated entity, as it will help in increasing the company’s profitability and enabling better service to customers. With the help of CRM, you will be able to understand your customer needs and behavior, thereby allowing you to identify the correct time to market your product to the customers. CRM will also give you an idea about the most profitable customer groups, and by using this information you will be able to target similar prospective groups, at the right time.